CHICAGO, ILLINOIS, 2018-Aug-31 — /Travel PR News/ — Hyatt Hotels Corporation (NYSE: H) announced today (August 29, 2018) the opening of Grand Hyatt Bogota, marking the first Hyatt hotel in the Colombian capital and the first Grand Hyatt branded hotel in Colombia. 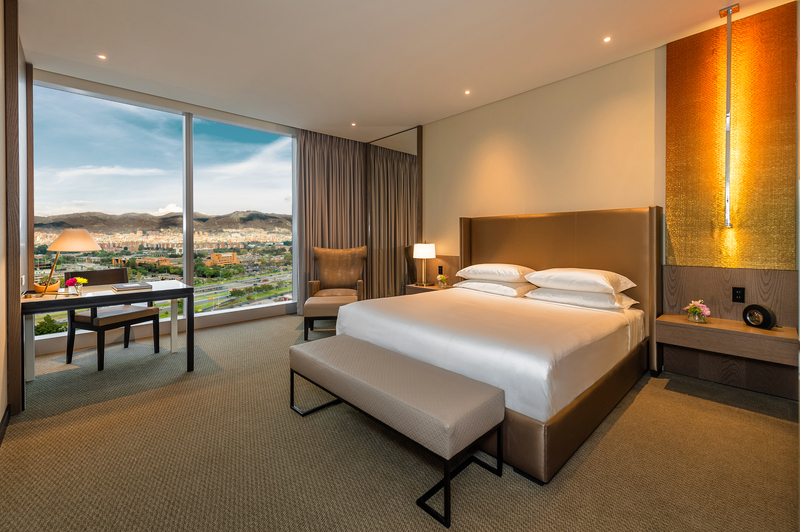 The 372-room luxury property is located in the heart of Ciudad Empresarial Sarmiento Angulo commercial district, up the road from the Corferias and Ágora Bogotá convention centers, and minutes from the ultramodern Gran Estación Mall, El Dorado International Airport, and Bolívar Square. Guests will discover great dining inside Grand Hyatt Bogota with some of the best Japanese and Colombian food in the city. At the upscale Ushin Japanese & Grill, umami flavors pair with stellar views for an elegant experience not to be missed. Capitalino Restaurant crafts casual eats for breakfast, lunch, and dinner, blending international tastes with Colombian traditions. Ilustre Bar is the place to go in the evening to share small plates and sip creative cocktails. Guests craving an expertly balanced cup of Colombian coffee, can head to Aldeana Market and grab delicious baked goods. Around the world, Grand Hyatt hotels bring travel dreams to life by celebrating all that is iconic within the destination. Located at the crossroads of local culture and global business within major gateway cities and resort destinations, each Grand Hyatt hotel is uniquely designed to reflect its own distinct environment and provides a hub for travelers and locals alike. Grand Hyatt hotels deliver bold and vibrant moments of more offering guests superior service, first-class accommodations and an abundance of options within a multicultural backdrop of dramatic architecture and innovative design. Grand Hyatt properties boast inventive restaurants, luxury spas, fitness centers, and business and meeting facilities. For additional information or to make a reservation, please visit grandhyatt.com. Follow @GrandHyatt on Facebook and Instagram, and tag photos with #GoGrand. This entry was posted in Hotels, Luxury, Travel, Travelers and tagged Bogota, Colombia, Grand Hyatt®, hotel, Hyatt, Myles McGourty, Philippe Frey. Bookmark the permalink.